There are many users who set their sample rate to one sample every couple of hours. This is typically 4 hours for the Thermocron and even slower for Logtags. I think this is a hang over from min/max thermometers, where staff would check them once or twice a day and write down the readings. Users believe that the sample rate is repeating this process. The reality was that a min/max thermometer was responding reasonably quickly to changes in temperature and would “remember” the highest and lowest temperature. In one sense, they were sampling every second of the day and only remembering two readings – the highest and lowest. 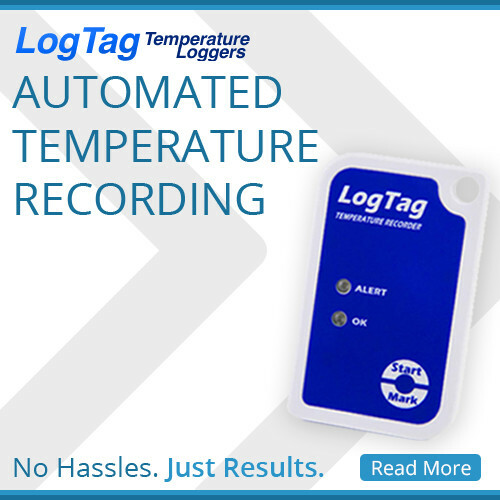 For a temperature logger to provide a reasonable coverage of what is happening it needs to be sampling at a reasonably fast rate. The definition of “reasonably fast” is fast enough to get a couple of readings in the event you are interested in. For example, if you want to know if the temperature exceeded the limit for half an hour, then you need to be sampling faster than 30 minutes. In fact, I would recommend a sample rate of 10 to 15 minutes. If you are sampling only once an hour, it is possible to totally miss the event. The second consequence is that if you do catch a sample, you have a very poor estimate as to how long the event lasted. All you know is that the reading an hour before was good, and an hour later it was good. The event could have lasted from anywhere from minutes through to nearly two hours. With a sample rate of 4 hours this scenario becomes even worse with the event possibly lasting anywhere from minutes up to nearly 8 hours. Stock being too warm for 8 hours is very different to stock being too warm for 30 minutes. The solution is very simple. Sample more frequently. The reality is that stock in fridges and freezers take time to heat up and cool down so an incident in a fridge or freezer will actually need to last a reasonably long time to have an impact on the stock. So slowing the sample rate down to 20 to 30 minutes is justifiable. My recommendation is to keep it at or below 20 minutes. In my next blog I cover the other extreme.